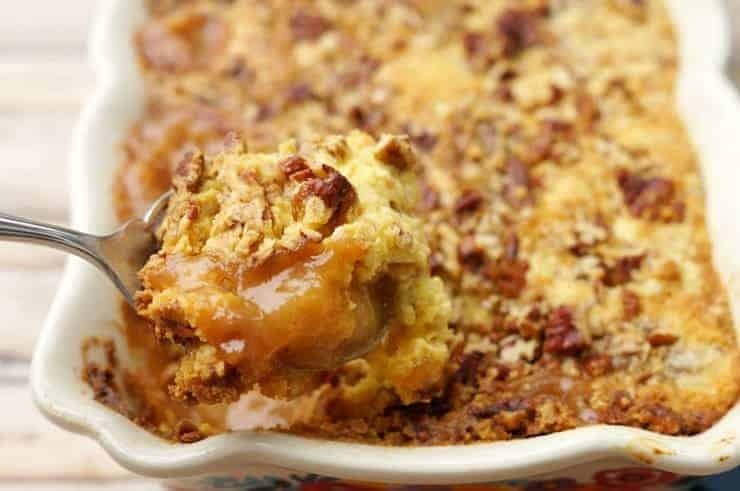 This gooey Caramel Apple Dump Cake Recipe with delicious pecans is light on ingredients but big on flavor! 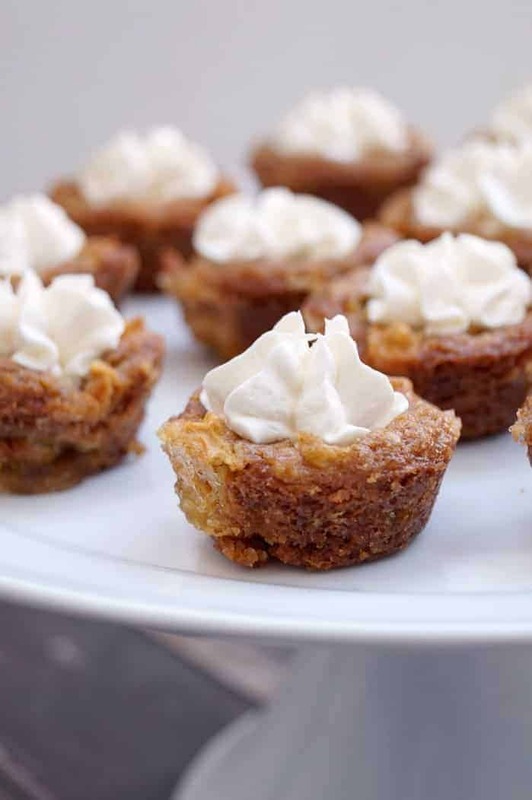 This easy dessert recipe will be the only apple recipe you need all fall long! We love apple recipes and some of our favorites are our Overnight Stuffed Apple Pie French Toast and Caramel Apple Chips. 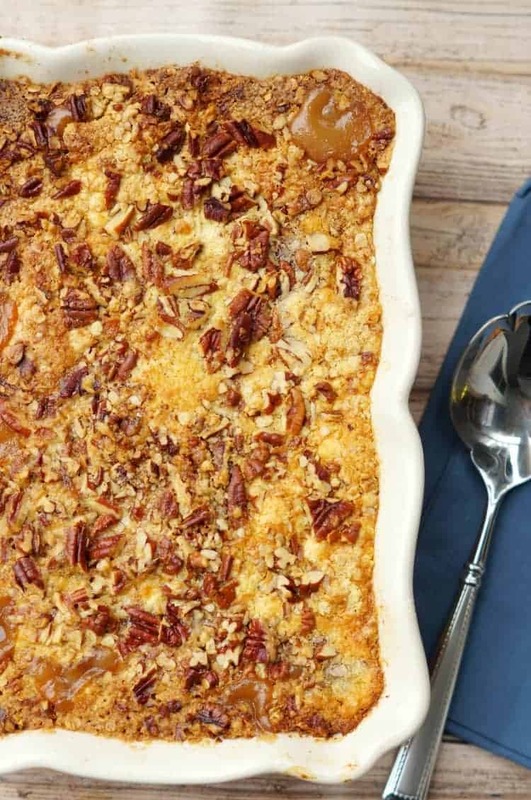 We can never get enough delicious Fall apple recipes! 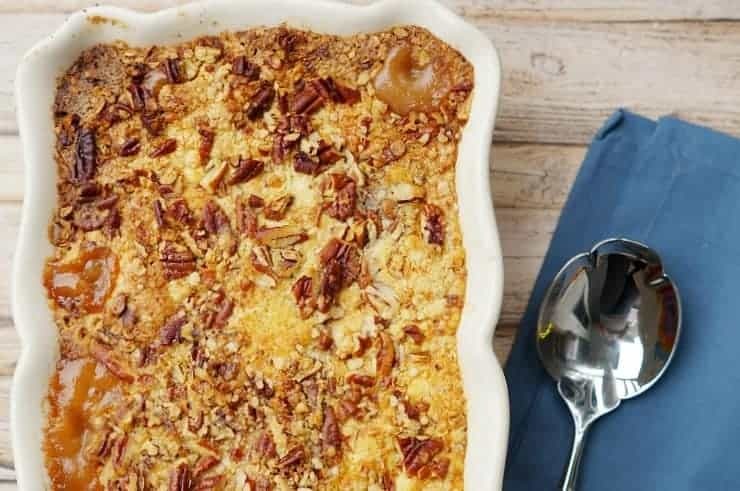 That is why this Caramel Apple Dump Cake Recipe is one of our newest favorites – add on some delicious pecans and you will be forever in love! The warm caramel apples filling and the delicious butter and cinnamon will warm your house with amazing smells and your bellies with an even better taste! Hi everyone! 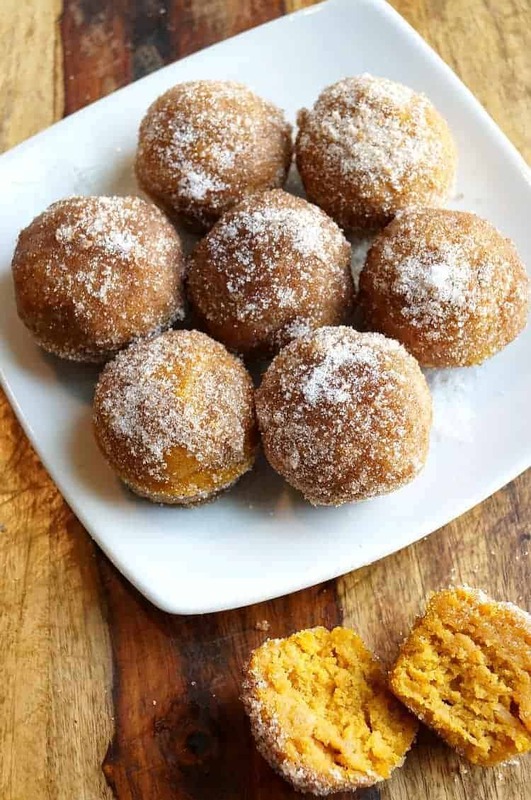 Amanda here from Old House to New Home sharing a great fall dessert! This simple dump cake recipe is full of fall flavors, cinnamon, apple, and caramel! 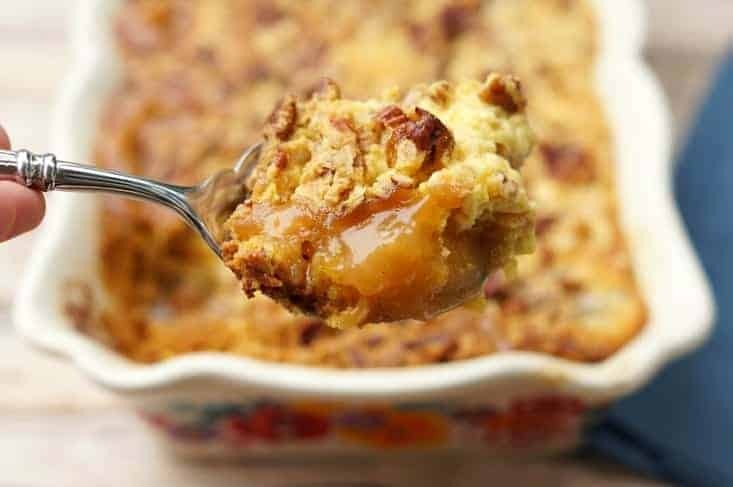 Delicious apple pie filling is mixed with caramel then topped with a simple topping of cake mix, oatmeal, and pecans and then of course, topped with melted butter. After some time in the oven, you have an amazing dessert that only took you minutes to prepare! I am an ooey gooey type of dessert person. Is that a thing? I love my cookies super soft, my brownies under baked, and I cannot get enough of lava cake. There is just something about a gooey dessert. It is so warm and comforting. This cake is best served warm, which makes the caramel even gooier, and it is just amazingly good. This cake couldn’t be easier because it takes three store bought short cuts, apple pie filling, caramel sauce, and cake mix. You could definitely make your own apple mixture for this if you have fresh apples on hand, but in my neck of the woods, we won’t have in season apples for another six weeks or so. Feel free to make your own homemade apple pie filling though if you have a favorite recipe! Once you stir, everything gets dumped into the pan! 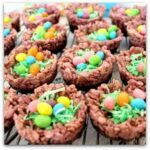 Most dump cakes just use a cake mix, but I did add some oatmeal to the topping for additional texture! 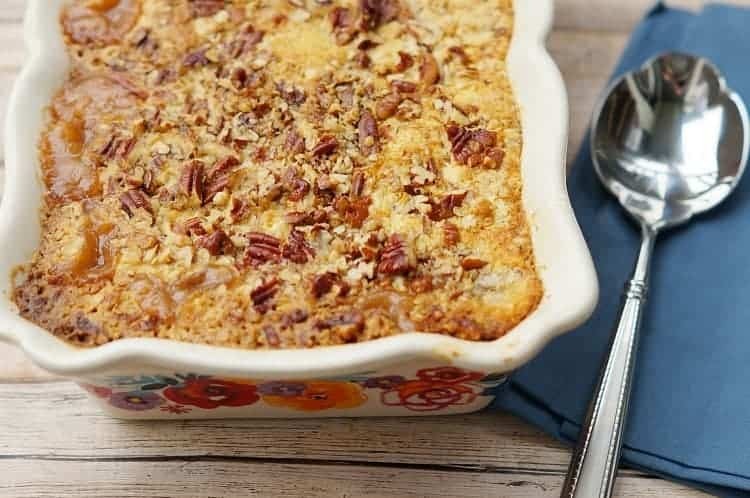 You could also leave out the pecans but I do think they add a delicious element to this recipe. The bit of saltiness breaks up all the sweet and richness and of course, adds a delicious crunch. You could substitute for walnuts if you’d prefer! If you love fall flavors as much as I do, then you need to whip up this easy Gooey Caramel Pecan Apple Dump Cake as soon as possible! 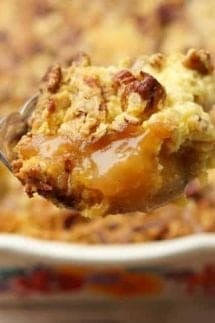 In a mixing bowl, stir together apple pie filling, cinnamon, and caramel. Pour into the bottom of a 9 by 13 baking dish. Spread into an even layer. 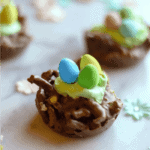 In another bowl, mix together cake mix and oatmeal. Pour over the apple pie filling into a single layer. I only used about 3/4 of this mixture. Discard the rest. Top with pecans and evenly pour butter over the entire cake. Then place in the oven. Cook for 40-55 minutes, or until caramel bubbles through the topping and a toothpick inserted into the topping comes out clean. If your pecans or corners start to get too brown, cover with aluminum foil for the last 10-15 minutes. Serve warm with ice cream or whipped topping. Become Your Own Boss – Earn Unlimited Income From Home! It looks delicious but I don’t see where the butter would be added. Hi Dawn! You pour it over the cake right after you add the pecans. Totally yummy looking. Thank you for sharing your creativity!